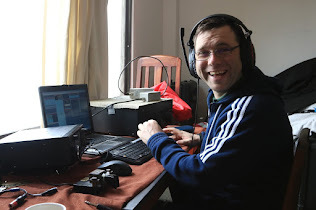 Tom EI4DQ has recently worked his last state for the ARRL (WAS) Worked All States award on 144 MHz. This award involves working and confirming each of the 50 states of the United States of America. Tom tells us that the most difficult states to work were Rhode Island, Nebraska and Iowa. Tom EI4DQ has concentrated in recent years on EME (also known as Moonbounce) and achieved DXCC on 144 MHz a few years ago, the first and only EI to achieve that award. Tom is an inspiration to us all and this shows us that with commitment and dedication everything is possible. A Job well done Tom and congrats on this fantastic achievement. RADIO SOCIETY OF GREAT BRITAIN. THANKS FOR CHECKING ME OUT COME BACK AGAIN SOMETIME 73'S DE EI5IX . Awesome Inc. theme. Powered by Blogger.